We've seen plenty of curved screens, but Sony has just revealed the first picture taken with a curved image sensor that may one day bring cheaper, smaller lenses and higher photo quality. Regular, flat camera sensors have a rather large problem called "Petzval field curvature." That occurs when light rays passing through the edge of a lens fall in front of the sensor's focal plane, rather than on it. As a result, optical designers must add costly elements to lenses, which also makes them heavier and more complex. The shot above flaunted by Sony is just a test and there are no high-resolution samples available yet; in fact Sony has indicated that high-megapixel sensors may be a ways off. However, it does mark the first image shown from Sony's curved CMOS sensor and a possible new direction for its digital camera division. 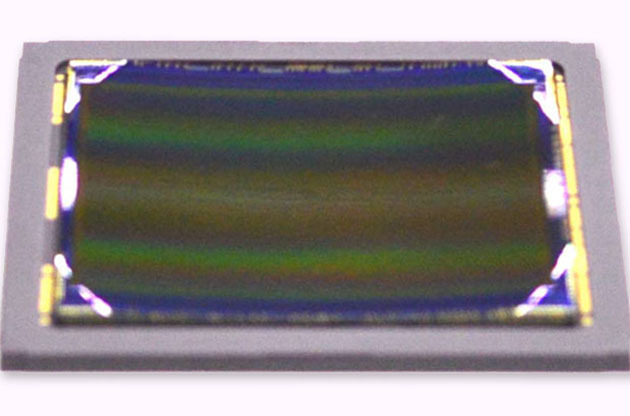 A sensor with the edges bent toward the lens takes care of many optical sins. Sony built its prototype curved sensor flat, bent it into a shape known as a "Petzval surface" and reinforced it with a ceramic backplate. That geometry permits shorter, lighter lenses with larger apertures that let more light in. In addition, such a design also reduces light falloff at the edges of a typical flat CMOS sensor, and the process of bending a sensor introduces strain in the photodiodes that actually benefits them by reducing noise. Finally, Sony added that its sensors work the same way as the human eye to fix optical issues, and even have a similar level of curvature. As such, Sony has constructed a 2/3-inch prototype sensor typically seen in compact cameras, along with a full-frame version. As it happens, the latter sensor would work very nicely in an RX1-type camera. When such sensors arrive commercially, they're likely to be used in fixed lens and not mirrorless or DSLR models to start with, since they wouldn't work with any existing lenses on the market. In fact, there's a rumor that a possible RX2 will be announced in September at Photokina 2014 -- we're not holding our breath for a curved sensor on it, but you never know.